It's the July 4th weekend. A big weekend and lots of folks descend upon the Shelbyville area for show, after show, after show. I flew down alone. Scott was supposed to have come with, but at the last minute we returned his ticket. There was only one junior trail pleasure class out of all three shows. So Bourbon would maybe only show once. A long way to come for one class. We decided he should come for the international instead, that would be a better choice. It would have more classes to watch and Diva would be there too. So I flew down alone the evening of the 3rd. The only bright cloud, was that they moved the show from the outdoor slop-fest it would have been, to the Champion arena on the Celebration grounds. 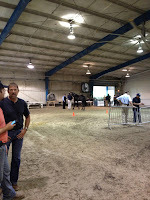 So, we would be under cover in the practice ring, and for the show. That was a smart move, especially considering the amount of people who come to show during the holiday weekend, and because these shows are mostly done for charity. That makes it even more important that the show must go on, and be financially successful. A dry show ring will do the trick. To back up a little bit, I had a great practice ride. B looked totally awesome as I watched Hannah warm him up. In fact I don't think he's ever looked that good. Back stride, head shake, and now a little snap more in the front. Just awesome work from Hannah, Bub, Candy and the HP team. I got a lesson and even more instruction from Hannah. I was totally grateful - as her barn was filled with numerous customers all waiting for her attention. Every second with her is precious time on a busy weekend like this. So, 20-30 minutes is absolutely golden. 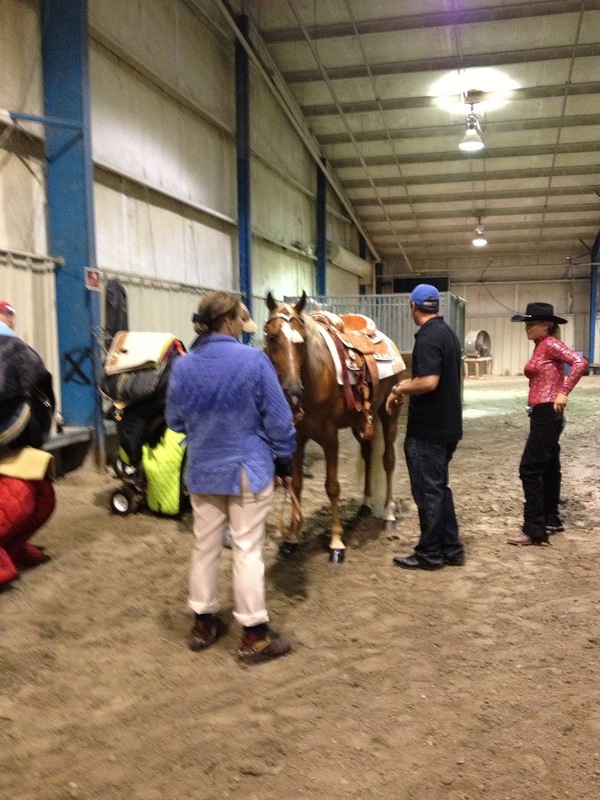 Tonight's show only had one amateur trail pleasure class. And it was NOT a junior class. So that means if we went in the class it would be against the aged horses with more experience. But if we didn't go in, we'd only show once all holiday weekend. If we did, it would be a tough class. In the end, we decided to do it, knowing it was a preliminary class before tomorrow night's junior class. Okay...with that decision made, now, what to wear? On my way home I made a stop to look at a new saddle. So many decisions to consider, it was good to talk with Patti Pollack, of Bling Tie Affair, as she was a good advisor, and described or showed me some beautiful alternative choices. I fear what the estimates will come in at....but it will give me something to consider should I take the plunge. Or it could become the dream item I ask Santa for if I'm a good good girl this year. Besides i must be doing something good, he already brought me my pony. ;). LOL. Then it was back to Jane's for a shower and to get ready. As you can only guess, it was rain and thunder all the way to the show. I arrived at the celebration grounds and parked and headed into the warmup arena to locate the HP team. The saddles and blankets were all stacked and ready for the night. Bub was there sorting items, as well as Hannah warming up skyy for the flag presentation. At 615pm the show finally started. B would be in class number 5. So we were in chaps , hat and saddle pad almost instantly. And after just a few warmup rounds our class was called. Warm up at the HP corner. Hannah ready for the flag. The walk to the arena was pretty wet and sloppy, and then you had to go up a pretty serious 45 degree ramp into the ring. As I entered Hannah wished me luck and reminded me to have fun. You can do this, you did it all morning in practice. Yep, we did. So let's go do it again right now. Let's bring it for these aged horses and give them a run for it. And so that's what we set out to do. B felt good. He holds himself now. Up in the chest. And he is ridden with his head set, but looser rein. And I can feel he's not that young horse that was collapsing and all wiggly. He is maturing, and has muscle and coordination. He is truly coming into his own. I put him on the rail and asked for his nose. He gave to my cue and shook. Yeah! And wow! Hannah has him totally in a new place. It is really awesome to ride this horse. He's powerful and so well trained. Really if it wasn't for the pressure of the show, huge audience, and my stomach ache, this would be a perfect experience. And despite all of that, it almost was anyways. I work at maintaining his speed and at the give and take on the reins. The footing is a bit worrisome. It is soft and deep at the rail, and it's choppy and unleveled a few feet in. I look ahead and decide to head even closer to center where it seems to be smoother and solid. That seemsto be a good choice, as I can really hear Bs footfall with a clomp clomp clomp clomp. A four beat gait...a wonderful resonating sound. So I continue to monitor for good terrain ahead and aim B to the best scenario as I travel around the ring. The reverse is called and soon we are heading into the lineup. Or at least it felt like time flew during our class. As I lineup I am thinking he did good. Hannah's comments ringside were positive. And no tripping (yeah!). Moments later they call number 824. Watchin For The Storm! B!!! I step out from the lineup and look around. Jennifer Potts is the photographer and she waves me to the winners circle. Hannah runs out, tosses dirt in the air so B turns his ears forward for the winners picture. I am so excited. I can't believe it. The rest is a blur. Hannah talks to me about direction for the victory lap, she coordinates the placement of his ribbon so it'll show as he takes his lap. The other winners are announced, but I don't specifically register the names. It's exciting, it's a blur, and I know I have to do a lap. So as Hannah finishes with his ribbon and gives some more instructions, I begin to walk him while the last ribbons are called. Then after a pause, I pick him up slowly and he starts to flat walk. I head into the far curve of the ring, check his nose and come into the straight-away bobbin that head. I can hear some cheers and the crowd is clapping. And Bourbon takes his lap like the champ that he is. And I feel so happy.....and I can feel a seriously huge grin fall across my face. Watch the victory lap on ReporTV at: Bourbon's Victory lap. Wow! Cool! Just wow! Blue on the fourth of July. In the class we didn't expect to win...my little junior horse winning the independence day blue ribbon. I'm sure that stupid smile was on my face the rest of the night. And I'm almost certain those firecrackers that night were bursting in celebration to Bs accomplishment. And to Hannah's accomplishment...it is amazing what she's been able to accomplish with me...and with bourbon. And between all the rain and all the thunder, there sat cloud 9. Who woulda thought.